These adorable creations are from Kirstie Williams' etsy shop CuriousCephalopods, where you can also commission ones in any color you wish. Not only are they awesome — look at those tentacle curls — I am counting on one to provide protection from nature's most intelligent sea creatures. 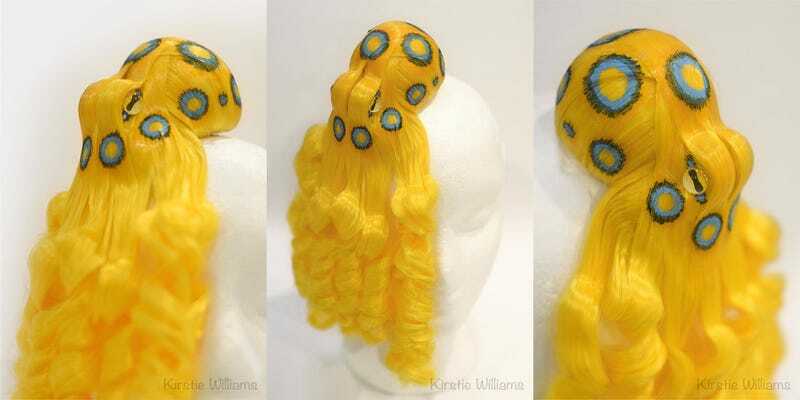 Here's the process I took to create my Octopus hairwig. Hopefully these steps help anyone else trying to create their own octopus, or any other shape for that matter. Took at least one pack of Arda's Long Wefts (get two if you're unsure or if your shape is big). 1. The piece isn't completely made of hair. There is a foam shape at the core. In this case I used a Styrofoam sphere that I hollowed out on one side to create the bulbous part of the body. I used expanding foam that I then carved to create the eye and upper-leg portion. 3. Start adding wefts! Ok, so I separated my wefts into sections 4-5 inches wide, folded the sewn part over itself so it's three layers thick and glued the sewn end together with hot glue. I then used hot glue to attach this part to the underside of the foam shape (where I had carved the Styrofoam out). The hair is stretched over the felt-covered shape and secured down with some tacky glue. You can dilute this if your's is very thick. I used pins and bobby-pins to hold the hair in shape while it dried. Be prepared for this to take several days, allowing sections to dry overnight. 4. Keep adding hair neatly, paying special attention to which direction your hair is going. Remember you want the long ends of the last few wefts to come down over the 'leg' sections of the body so they hang down like tentacles. 5. These tentacles are then rolled up with hair curlers. I used hot water to make the hair stay curly but you could use a curling iron if you have one. Be sure you are using heat-resistant hair or it will melt! Best to try it out on a little bit of hair first if you're unsure! 6. I used a little copper-coloured paint to give my octopus some spots and a shiny underbelly. 7. And here it is attached to the wig! To do this I used some pipe-cleaners hot glued to the underside that I could then poke through the netting of the wig and twist around to hold it on. It was quite heavy so needed six holding points. The wig also required a pair of hair clips sewn into the front to stop it sliding backwards when worn. It's always nice when someone is both willing to sell a creation and teach you to make one for yourself. It gives options for the crafty and the DIY-helpless.